Hanging pictures can be a nightmare of measuring tapes, levels, and holes in the walls – only to end up with your pictures still crooked and out of line. With the Gallery Magic system, you won’t have to work so hard and still end up with nicely spaced and level artwork. The first part of the Gallery Magic system is a small steel plate with a rare earth neodymium magnet. Screw this into your wall using the supplied screw and drywall anchor. You screw the larger metal plate to the back of your frame using the two supplied screws; Gallery Magic is designed specifically for wood frames. 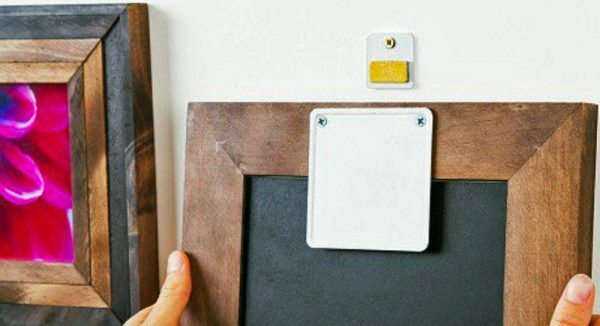 To hang, you simply let the magnet grab the metal plate on the back of the frame. The frame plate is large enough that you can slide the framed artwork around to make adjustments to the way the picture hangs until it is lined up properly and level. A single Gallery Magic set supports up to 15 pounds; use two sets for heavier pictures. A single Gallery Magic magnetic wall hanging system is $12.95 at The Grommet. You’ll receive a 10% discount if you order 3 or more wall hanging systems. You can also learn more and order at the Gallery Magic website.